Tony Horwitz has written an excellent article in The Atlantic called “150 Years of Misunderstanding the Civil War.” Horwitz, author of the very pereptive A Confederate in the Attic, makes the point that point that most Americans have a thin but generally positive view of the war, a post-WW II, post-civil rights era assessment that holds that because the war ended slavery, an `all’s well that ends well’ view of the conflict should pertain. 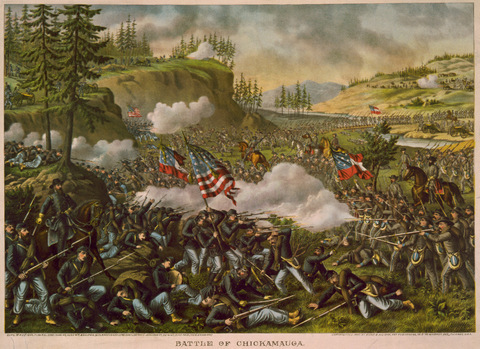 “We’ve decided the Civil War is a ‘good war’ because it destroyed slavery,” Horwitz quotes historian Fitzhugh Brundage. “I think it’s an indictment of 19th century Americans that they had to slaughter each other to do that.” Horwitz says that this view was also held “by an earlier generation of historians known as revisionists. From the 1920s to 40s, they argued that the war was not an inevitable clash over irreconcilable issues. Rather, it was a “needless” bloodbath, the fault of `blundering’ statesmen and `pious cranks,’ mainly abolitionists. Some revisionists, haunted by World War I, cast all war as irrational, even `psychopathic”’ Horwitz points to a new generation of skeptics, including David Goldfield, author of America Aflame, who says that the war was “America’s greatest failure.’ Goldfield accuses politicians, extremists, and evangelical Christians for polarizing the nation to the point where compromise or reasoned debate became impossible. I have often wondered if the war was worth it. More than 700,000 dead (plus tens of thousands more wounded) versus the prolonged enslavement of 4 million people? It is some kind of cosmic ethical math problem that only God could solve, and God, when he had the chance, picked war. Imagine if the the north had allowed the south the secede. I think the north would have embarked on an effort to acquire Canada, either through war (the United States and Great Britain nearly went to war over Canadian issues in 1862) or through acquisition (it seems there was genuine interest on the part of Britain to sell the place. Add Alaska in 1867, and the United States of North America looks mighty strong. I don’t know about the Confederate states. There would be expeditions to conquer land in Central America, Mexico and Cuba; not clear that they would succeed. French interest in Mexico would create problems in Texas, Louisiana and maybe Florida, and there would be continued problems in west Texas with the Comanches, as S.C. Gwynne showed in his wonderful Empire of the Summer Moon. Booth countries would have turmoil along their mutual border, as malcontents on both sides would have a place to look longingly towards. The south would have more problems: slaves would now have some place to escape to, and there would be no Fugitive Slave Law to require their return. Would slavery have ended? I like to think it would have, and before the turn of the century. First, slavery was dying out in the upper south. Second, the war interrupted a nascent southern populist movement that might have grown into a force. Third, might there have been a reform movement started by women; whenever I read Mary Chesnut‘s observations, I see a woman with a sharpening sense of the hypocrisy and injustice and cruelty created by slavery, and she doesn’t like it. Finally, I suspect young southerners would have seen the dynamisn in the north, and would have rebelled at the recondite practices of their parents. Progress may have been more possible if the south had not lost a war. Solutions may have been reached more swiftly–and might have been more easily accepted–if pride and disgrace weren’t involved.